The other day I was coding an FPGA design that needed a source of normally distributed random numbers. 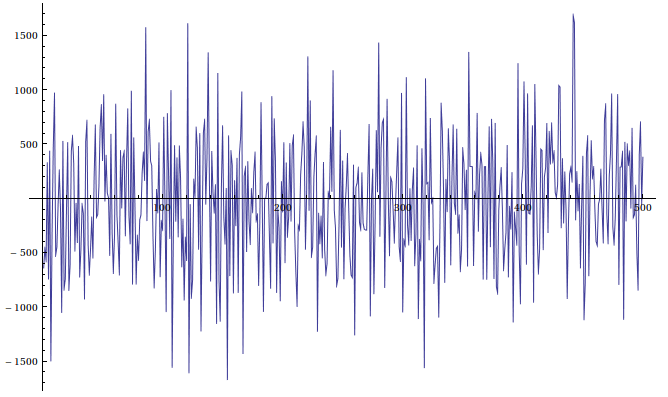 Uniformly distributed random numbers are fairly easy and cheap to generate with a linear feedback shift register, but generating normally distributed numbers is a harder problem. There are several ways to generate a normally distributed number using one or more uniformly distributed, some are more accurate than others. For my purposes the numbers don't need to exactly follow the normal distribution,, it's enough if it seems like for a normal human that the numbers are from the normal distribution. So I went for the easiest and cheapest implementation and use the central limit theorem, which says that summing sufficiently many independent random numbers result will be approximately normally distributed. I went for the sum of four uniformly distributed random numbers generated by a linear feedback shift register. To avoid obvious period in the output I decided to have a rather large 31-bit registers. 31-bits because it's big enough and it needs only two taps when a 32-bit register would need four. Implementation of the linear feedback shift registers is very straight forward. Seed value and output width can be set with generics making it also useful in many other places. Summing four of these uniform random numbers should generate number that is almost normally distributed. Code for the normally distributed pseudorandom generator is below, it outputs 12-bit signed numbers every three clock cycles, but it should be easy to modify it to work in one clock cycle just by adding more adders. I wrote a testbench to write output values to a file and a mathematica notebook to test how close the numbers are to the normal distribution. Histograms were generated with "Histogram[x, 200]" command and plots with "ListPlot[x, Joined->True]", where "x" is a list of values. 500 output values of the generator. Same amount of samples from the normal distribution. You can see that the approximation is pretty close to the normal distribution. It's maybe a little bit fatter, but it wouldn't be noticeable without comparing it to a true normal distribution. 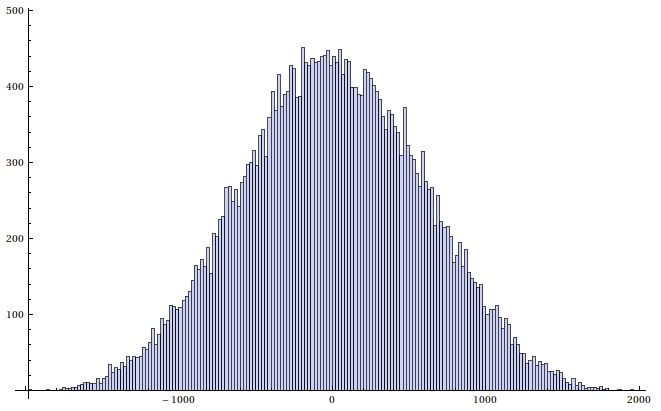 Histogram of the generated numbers. Does it look like a normal distribution? 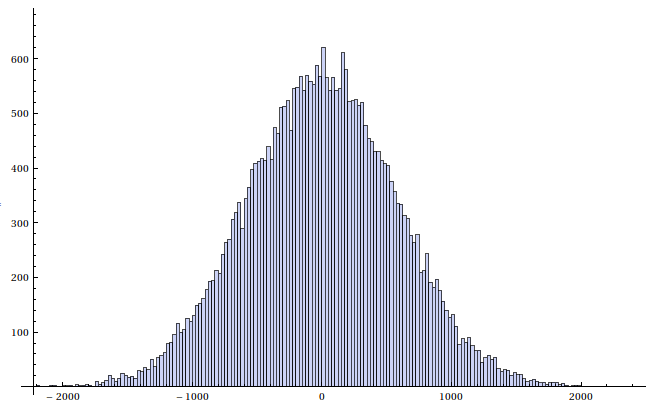 Histogram of the same amount of random numbers generated from the normal distribution. 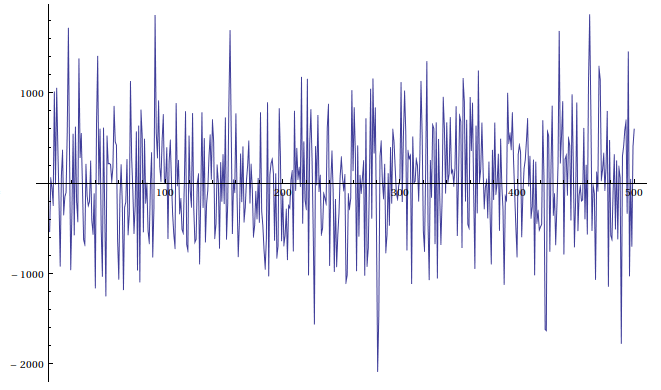 Notice the different values on the axes. As you can see from the histograms the approximation is a little bit flatter, but it comes amazingly close. Just by looking at the histogram without a normal distribution to compare it to, I would say that it is a normal distribution and that's the only thing that was important.